Lawn Seeding: The Ins and Outs of seeding your yard. The best time in cooler climates for lawn seeding is in the Spring (April 15th - May 15th) or Fall (before October 15th). Seed planted in the fall usually wards off weed growth. The correct soil temperature for seeding lawns in cooler climates is 60 to 75 degrees fahrenheit. It is best to plant warm season grasses in the Spring when the soil temperature is 75 - 85 degrees fahrenheit. Proper germination is dependent on soil temperatures. Following the time guidelines indicated above are important. What combination of lawn seeding will work best in your climate? Is the grass going to grow in a sunny or shady area? What are the traffic patterns on your lawn? I live in the Mid-West. A Kentucky Bluegrass, Perenniel Ryegrass, Fall Fescue mix works best for me. Bags of grass seed are based on the square footage of the area that needs to be seeded. Make sure you determine the square footage before you begin lawn seeding. Always buy more seed than you need. You do not want to run out of seed in the middle of your project. Note...grass seed has an expiration date. A bag of seed is only good for 10-12 months. After a year, the seed may lose it's ability to germinate. Grass seed is sold as either a blend or a mixture. A blend is one species of grass with many varieties of the same species. A mixture contains more than one type of grass species. This is your best bet because it provides diversity in your lawn. One species may be good in the shade, one may be durable in high traffic areas and one may be able to better handle stress. The mixture gives you the best elements of all grass types. When buying grass seed be sure to read the bag. Manufacturers are now required to indicate the percentage of fillers or weed seed that are contained in the mixture. You want to grow a beautiful lawn not a field of weeds. You don't want to have to apply a herbicide a few weeks after your new grass grows. Read the instructions on the bag of seed. Rototill the area you are going to seed at least 5 inches deep. This loosens the soil. You want to make sure you remove all unwanted debris, weed roots, branches, etc. Apply a basic starter fertilizer to the soil by using a spreader. If you have a rotary spreader it should be set for sowing seed. Spread the seed in a checkerboard pattern. You want straight lines of seed first in one direction. Then you want straight lines of seed in the opposite direction. You can seed your lawn by hand. However, using a spreader will ensure you have even seed coverage. Take a metal rake, make sure you have it turned upside down so it's prongs are facing upward. Move the rake through the soil in an "S" pattern. This will create additional rows for the seed to roll into. This will help with the germination process. Use a weighted roller over the entire area. For best results either leave the roller empty or fill it half-way with water. You do not want the soil to become compacted. All you want to do is help the seed germinate. Top dress the area you seeded with an organic mulch. You only want the mulch 1/4 inch thick at the most. Too much mulch will keep the sunlight away from the grass. Sunlight is an important element in planting grass. Water the area where you planted the seed. This begins the germination process. The first time you water this area do not saturate the soil. You don't want the seed and soil floating away. Moisten the area 3-4 times a day until the seed germinates. Once you see new grass growth, you can reduce the number of times a day you water by half. At this point, a root system has begun to form so you can water deeper into the ground. Germination times vary. Cool season grasses typically take 3 to 14 days to begin to germinate. By following these simple steps you will grow a beautiful lawn. Seeding lawns has worked best for me over the years. I seed my own lawn. I have a large pine tree in my front yard that has grown to be taller than my house. I have even been successful in growing grass under this pine tree, a very shady area by lawn seeding. 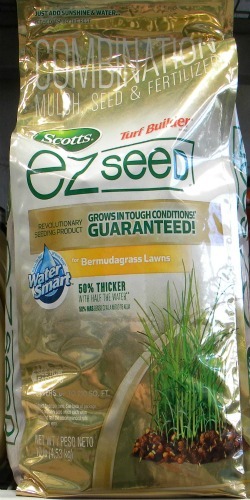 Bermuda Grass Seed - Warm weather grass seed. Common from the Transitional Zone and South. 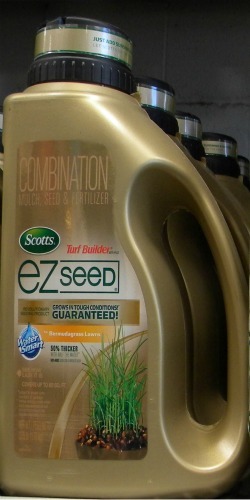 Seed includes: mulch, seed and fertilizer all in one.